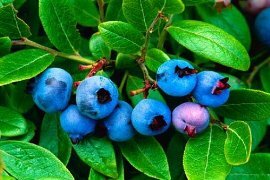 Use the creeping blueberry plant as an edible groundcover. The plants only grow 3-4 inches tall and hug the ground. The light blue fruits are of fairly large size for such a small plant. The delicate green foliage changes to deep red every fall. Hardy in zones 3-7.